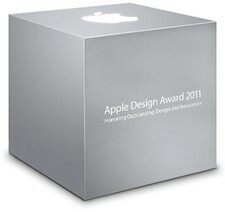 Apple Design Awards for 2010 did not award Mac Apps but with the Mac App Store, the Mac Apps return. â€¢ Grades 2 GPA calculator. â€¢ Pennant baseball history and statistics. â€¢ Pulse News unique RSS reader. â€¢ Capo music learning app. â€¢ Anomaly Warzone Earth strategy game. â€¢ Cut the Rope popular puzzle game. â€¢ Golfscape GPS Rangefinder a golf app with augmented reality. â€¢ Infinity Blade an action game. â€¢ Osmos a fun physics game. â€¢ Our Choice a dynamic ebook. â€¢ djay a DJ music app.